Unless you’ve lived under a rock for the past decade, you’re probably aware that Cummins engines can make some serious power. When we wrapped up Project Hot Rod RV, we had gone from 19s to 15s in the quarter mile, had better fuel economy, and had a truck that could still maintain its reliability. With a few simple fueling modifications we went from about 130 hp at the wheels to around 350 hp, all with a stock turbocharger, stock timing, and a stock transmission with a Goerend valve body. But we wanted more. 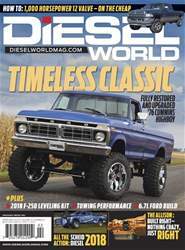 When it comes to turning a diesel truck into a true hot rod, a big part of the equation is four-wheel drive. Diesel engines are heavy and the trucks are long, giving them terrible weight distribution for two-wheel traction, even with racing slicks. While it’s possible to make two-wheel drive work with engine setbacks and body and chassis modifications, wouldn’t you rather just have a 4x4?